1 in 10 young people will experience a mental health problem and, sadly, 90% of those young people will experience stigma and discrimination. Stigma stops young people seeking help; it stops them living normal lives, and sometimes it makes them give up on their hopes and dreams. That is why, I'm writing to ask you to support the #ToiletDoor campaign. 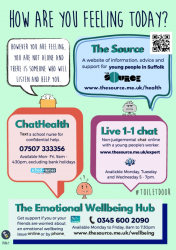 The campaign responds directly to young people in Suffolk who have said that they would like better information on the emotional wellbeing support services available to them and they would like this information on the back of toilet doors because this is somewhere they can take down the information they need in private. 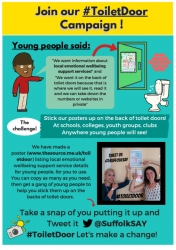 With this in mind, a poster of local support services (downloadable below) has been designed to be printed out and stuck up on the back of toilet doors - anywhere young people may be, like schools, colleges, university, youth groups, sports centres and sports clubs. A brief explanatory leaflet is also attached for reference and can be downloaded below. Please could you print out the poster and put it up on the toilet doors of any buildings within your control? Please also feel free to send to any other organisations who might be able to do the same.